For those of you who may not be aware of them, Creature Caster is a fairly new company specializing in large, resin demon character models. The stuff they make fits in very well with any of the classic GW Chaos factions, or any fantasy army that requires a large daemon character. Their "Nurgle" stuff is particularly excellent. I wanted a character model for my Nurgle AOS army but wanted to go outside of GW. The Maggot Demon seemed to be the perfect size model. It's small enough to be used for any number of named character models in the AOS army book, but large enough that it could also be used a daemon prince or even a Great Unclean One if you wanted. It comes with a squarish shaped scenic rock base, but for gaming purposes this base could be glued on top of a 50mm or 60mm round base without too much trouble. This model is AWESOME! The resin is top quality, feels like a hard plastic when you're handling it. Sprue flash and mold lines scrape off easily. The detail in this model is spectacular. The Maggot Demon has all kinds of festering boils and bumps on its skin, as well as maggot-filled pockets and holes that are positively disgusting! It comes in several nice, large chunks that will be an easy assembly. There are nice, large square tabs that fit into matching holes. Once I had trimmed all the flash away and test-fit everything, the pieces fit together perfectly. There may be a few slight gap areas that will need a little filling with putty, but overall the seams between the pieces are pretty tight. Creature Caster stuff is priced pretty typically for resin models of this size. Bigger models go for over $100 USD in some cases, and others come in between $80 USD and $100. 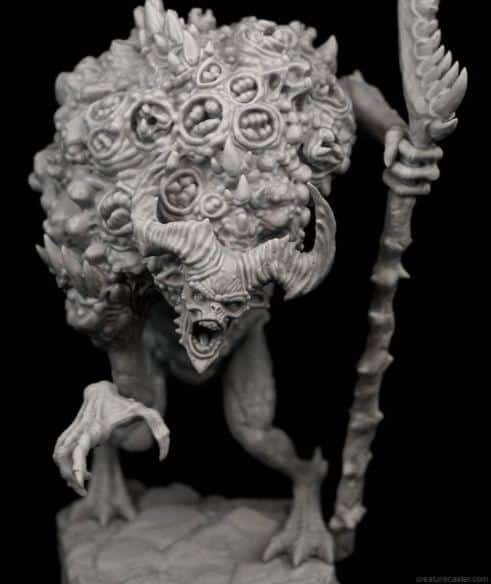 USD The Maggot Demon himself is $59 USD which I think is a great price for a model with this level of detail.